Wedding On An Absolutely Shoestring Budget!" How to choose the right reception location to ensure that your day is the best that it can be! Choose the wrong location and your wedding reception will be an absolute disaster! I will reveal the insider strategies of choosing the ultimate reception location regardless of your location or budget! How to plan out every detail, every element like a pro!! 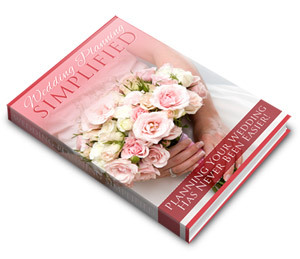 My step by step blueprint to wedding planning will ensure that you address every element like a professional wedding planner, giving you the ability to scoop up deals that are never available to "regular" brides without a representative doing business for them.